Colder weather, turning leaves, light jackets, fall festivals, pumpkins can only mean one thing: Fall is here. So break out the cider because with it will return everyone’s favorite fall dates. Goat Kid Festival- Halloween on the Farm (October 21, 1-5 p.m.) Just a short drive away in Rougemont, you can tour the 95-acre Prodigal Farm and milking parlor, play with the wee goats, meet the milking does, and taste nationally award-winning cheeses. Barktoberfest (October 28, Noon-4 pm, Durham Central Park) Local celebrity judges will determine the winner of the costume contests, and you can enjoy treats from local food trucks and brewers while watching canine attendees show off their wooftastic tricks. Festival of Nations (October 13, Duke Homestead) Celebrate Durham’s vibrant and diverse global community. There will be music, performances, international foods, and exhibitors. Cost is $5 person. Want more? See all the fall festivals here. Split of flight of 5 ciders, grab a board-game, and hang by the fire-pit. It’s the perfect evening. Or when temperates start to cool, warm up with their hot mulled cider on the weekends. The 1970s and 80s were a phenomenal era for horror films, with some of the greatest, scariest, and in some cases, campiest films ever made. This series which showcases 16 of the creepiest horror films. It’s the perfect excuse to hold on to each other. Good for: Anyone that wants to knock out their fall bucket list in one fell swoop. Once it cools off, pick out a pumpkin to carve together or find your way out of a corn maze. For your complete fall bucket list, we recommend Hill Ridge Farm. Want more? Check out our guides to local pumpkin patches. Stock up just in time for Halloween. A local favorite, Little Shop of Horror has an awesome selection of movies, gifts, and oddities. You can actually visit all year around! This time of year, there’s nothing better than enjoying dinner and drinks on an open-air patio. A few of our favorites include Guglhupf, Namu, The Durham Hotel, Gonza Tacos, Foster’s, Parts & Labor, and Fullsteam. Want More? See our list of essential patios here. 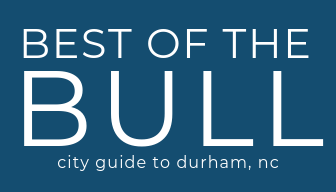 Next articleOur Best of the Bull App is now available for download on iOS and Android!